The Program offers strong research mentorship. Residents are paired with faculty members who oversee and facilitate research. Departmental resources including epidemiology expertise and funding are available to foster research and residents receive financial support to present their findings at regional and national meetings. 1. Meet with your program director or departmental research coordinator as soon as possible. - Find out what is expected by your program or department. - Talk about potential research areas and suitable faculty members who might be available to support you in the completion of a research project. 2. Look for resources that provide an introduction to the basic concepts of research methodology and critical appraisal. - Attend a local or national resource course or training program. 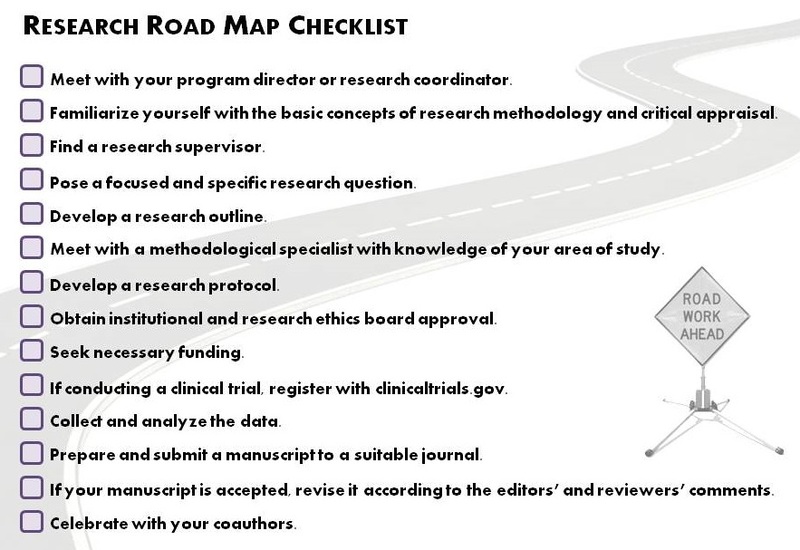 - Consult the references and additional resources listed at the end of this road map. 3. Find a research supervisor. - Look for someone whose expertise is relevant to your field of interest and who is able to devote sufficient time and effort to supporting and supervising your work. Most health trainees and junior practitioners have limited research experience and will need someone to guide and advise them along the way. Finding a suitable supervisor is one of the most important steps to success in planning and completing a research project. - Agree on expectations, including those with regard to authorship of any publications that result from your project. 4. Pose a focussed and specific research question. - Make sure your research question is novel, answerable and feasible. 5. Develop a research outline . - Conduct a thorough literature search. - If your project is designed to examine a therapeutic intervention, check for applicable systematic reviews in the cochrane library. - Collaborate with content and methodological experts. Your supervisor should be able to suggest suitable individuals and to facilitate an introduction to them. - Determine which study design is the best fit and the most practical approach to framing your research project. - Focus on the primary objective or question of the proposed research. - Include a brief background statement highlighting the importance of your research question. - Estimate how much time you will need to complete each of the anticipated stages of the research. - List available and required resources and, if applicable, provide a budget estimate. - If you already have a variety of interesting ideas to talk about, be sure to keep track of them, but for the purposes of your study outline you will need to boil them down to a single, focussed, primary study objective. - Make sure your outline is concise - a maximum of two pages is best at this point. - With the outline of your proposed research project in hand, arrange to meet with methodological specialists in preparation for writing a more detailed protocol. 6. Meet with methodological specialists with particular expertise in your area of study. - Refine the study's primary objective. - Discuss pertinent design issues, focussing on the primary study objective. - Bear in mind that planning and completing a retrospective study generally takes less time and fewer resources than a prospective study. - Consider conducting a clinical audit, systematic review or survey as a manageable project for your first venture in to research. - As necessary, estimate an appropriate sample size [3,4]. - Focus your energy on addressing the primary resaerch objective/question with just the right number of subjects. A study with too many subjects can expose participants needlessly to potential risks. A study with too few subjects might not have sufficient statistical power to detect a clinically important difference. - Design an appropriately sized, simple study rather than a small, complicated one . - Discuss the anticipated data collection and analysis methods. - Select the tools that will be appropriate for your analysis of the study data (databases, data entry software). - Investigate which file formats for data recording will allow your study data to be imported into an appropriate application for statistical analysis (Excel spreadsheet). 7. Develop the research protocol . - Create an expanded version of the outline created at step 5. - The proposal should contain as much detail as possible and provide the framework for ethics submission and ultimately drafting a manuscript. 8. As applicable, obtain institutional and research ethics approval. - Obtain approvals specific to your institution or research centre. - Seek help from your research supervisor and other university and hospital personnel who are knowledgeable about and experienced with approval process and requirements. - Find out whether your project is eligible for an expedited review, which will take less time tha a full Research Ethics Board (REB) review. A clincial practice audit, for example, might be eligible for an expedited review. - If your research involves humans or human tissues, review the Tri-Council policy statement  and complete the Tri-Council tutorial on the ethical conduct for research involving humans . - Consult with your research supervisor and collaborators to identify potential funding sources for your project. - Seek departmental and university funds first. - If appropriate, submit a grant to an external funding agency such as the Physicians' Services Incorporated Foundation or the Canadian Institutes of Health Research. 10. If you are conducting a clinical trial, ensure that it is registerd with ClinicalTrials.gov. - Member journals of the International Committee of Meducal Journal Editors (ICMJE), also called the Vancouver Group, require, as a condition of consideration for publication, registration of all clinical trials in a public registry . Complete the trial registration before any study participants are recruited and enrolled. 11. Collect and analyze the data. - Follow the data collection and analysis plan described in the research protocol. - Report confidence intervals, if appropriate, in addition to p-values for the results of the primary and any secondary research questions . - Remember that one of your responsibilities as a research is to communicate your results. - Find appropriate venues in which to present your work as soon as possible, such as your department's annual research day and relevant local, national and international meetings. 13. Prepare and submit a manuscript describing the study and its results to a suitable journal. - Familiarize yourself with the guidelines and checklists that you will need to follow in reporting your methods and results in disclosing competing interests. - As early as possible, establish authorship credits, including the order in which authors will be listed. The first author is generally the individual who has, overall, contributed the most, while the last author is generally the project supervisor. - The ICMJE criteria for authorship credit states that authorship requires: (1) substantial contributions to conception and design, or acquisition of data, or analysis and interpretation of data; (2) drafting the article or revising it critically for important intellectual content; and (3) final approval of the version to be published . - Be prepared to describe the contribution of each author. - Also consider those whose contribution should be acknowledged in the published article. 14. If your manuscript is accepted, revise it according to the editors' and reviewers' comments. - If your manuscript is rejected, take into account the editors' and reviewers' comments and consider submitting the revised paper to another appropriate journal. 15. Celebrate with your coauthors. - You have just completed a research project and have contributed to the creation and dissemination of new health science knowledge. Don't let this accomplishment pass without taking time to celebrate with your co-investigators and others who have supported you and the project. 1. Thabane L, Thomas T, Ye C, Paul J. Posing the research question: not so simple. Can J Anaesth. 2009;56(1):71-9. 2. Hulley SB, Cummings SR, Browner WS, Grady DG, Newman TB. Designing clinical research: an epidemiologic approach. 3rd ed. Philidelphia: Lippincott Williams & Wilkins; 2007. Appendix 1.1; p15. 3. Altman DG. Statistics and ethics in medical research: How large a samples? Br Med J. 1980;281(6251):1336-8. 4. Schulz KF, Grimes DA. Sample size calculations in randomised trials: mandatory and mystical. Lancet. 205;365(9467):1348-53. 5. McAlister FA, Straus SE, Sackett DL. Why we need large, simple studies of the clinical examination: the problem and a proposed solution. CARE-COAD1 group. Clincal Assessment of the reliability of the Examination-Chrinic Obstructive Airways Disease Group. Lancet. 1999;354(9191):1721-4. 6. Cummings SR, Hullet SB. Writing and funding a research proposal. In: hullet SB, Cummings SR, Browner WS, Grady DG, Newman TB, editors. Designing clinical research: an epidemiological approach. 3rd ed. Philidelphia: Lippincott Williams & Wilkins; 2007. p. 301-16. 7. Goodwin M. 2001. Conducting a clinical practice audit. Fourteen steps to better patiennt care. Can Fam Phys. 2001;47(11):2331-3. 8. Salant P, Dillman DA. How to conduct your own survey. New York: John Wiley & Sons; 1994. Chapter 5, When and how to select a sample; p. 53-72. 9. Pocock SJ. Clinical trials: a practical approach. Toronto: John Wiley & Sons; 1983. Chapter 5, Methods of randomization, and chapter 6, Blinding and Placebos; p. 66-89, 90-9. 10. Pocock SJ. Clinical trials: a practical approach. Toronto: John Wiley & Sons; 1983. Chapter 7, Ethical issues; p. 100-9. 11. Canadian Institutes of Health Research, Natural Sciences and Enginerring Council of Canada, Social Science and Humanities Research Council of Canada. Tri-Council policy statement: ethical conduct for research involving humans (December 2010). Ottawa: Interagency Secretariat of Research Ethics; 1998. 12. Panel on Research Ethics. Introductory tutorial for the Tri-Council policy statement: ethical condict for research involving humans. 13. DeAngelis C, Drazen JM, Frizelle FA, Haug C, Hoey J, Horton R, et al. 2004. Clinical trial registration: a statement from the International Committee of Medical Journal Editors. CMAJ. 2004;171(6):606-7. 14. Gardner MJ, Altman DG. Confidence intervals rather than P values: estimation rather than hypothesis testing. BMJ. 1986;292(6522):746-50. 15. Welch HG. Preparing manuscripts for submission to medical journals: the paper trail. Eff Clin Pract. 1999;2(3):131-7. 16. Rochon PA, Hoey J, Chan AW, Ferris LE, Lexchin J, Kalkar SR, et al. Financial conflicts of interest checklist 2010 for clinical research studies. Open Med. 2010;4(1):69-91. 17. Hoey J. Who wrote this paper anyway? The new Vancouver Group statement refines the definition of authorship. CMAJ. 2000;163(6):716-7. 1. Not establishing a focused, answerable question. 2. Enlisting a research supervisor who doesn't make sufficient time to advise and help you throughout the stages of the project. 3. Picking a topic about which you have little interest. 4. Planning a small, compicated study that attempts to answer many questions, rather than an appropriately sized simple study focussed on one primary objective/question. 5. Not taking the tme to draft a research outline to keep your research team coordinated and on schedule. 6. Not being realistic about how much time and effort your project requires. 7. Basing a prospective study on outcomes that are rare or take a long time to occur. 8. Entering data into a spreadsheet using formats that are not compatible with analytical software.The only thing worse than entering data is having to enter it twice! 9. Not meeting with a statistician to talk about the analysis before you begin collecting the data. 10. Waiting too long to begin. As you have no doubt already recognized, your biggest obstacle to successfully completing a research project wull likely be finding the time [1-3]. Here are some tips for staying on track to finish a research project. 1. Carving out one or more blocks of protected time is key . Use this time to develop your research proposal and start off o the right foot. Additional blocks of time can be used for data collection, analysis or write-up. 2. If you are in a two or three year program, consider a study design that will allow you to finish on time, such as a medical record review or practice audit, for which data should be comparatively easy to access and for which an expedited ethics review might be feasible. 3. If you are in a longer program, such as a five year medical or surgical specialty, consider the following timelines and milestones. In your first year, introduce yourself to the basic concepts of research methodology by taking a dedicated course or intensive workshop. Identify a research supervisor. Identify a methodological specialist to help you develop your research question, study design and research protocol in your second year. Submit your study for ethics approval and funding opportunities. If you are conducting a clinical trial, register the trial before you begin. Collect and analyze your data, and then present your findings locally, nationally, or beyond by the end of your third or fourth year. Submit your manuscript to a suitable journal early in year five, leaving your final term free to prepare for your certification exam and life after graduation. 1. Chan RK, Lockyer J. Hutchison C. Block to succeed: the Canadian orthopedic resident research experience. Can J Surg. 2009;52(3):187-95. 2. Silcox LC, Ashbury TL, VanDenKerkhof EG, Milne B. Residents' and program directors' attittudes toward research during anesthesiology training: a Canadian perspective. Anesth Analg. 2006;102(3):859-64. 3. Gill S, Levin A, Djurdjev O, Yoshida EM. Obstacles to residents' conducting research and predictors of publication. Acad Med. 2001;76(5):477.